Listen to Tim Key under the clock. Photo: Sean Batten. Arriving or alighting at Waterloo, you instantly understand why it's Britain's largest and busiest station; historically it's been a departure point for armed forces, Epsom race goers and city workers. Nearly 100 million entries and exits were recorded at Waterloo during the year 2014/2015, and this is only going to increase in future. As you emerge from the underground and into the Jubilee line ticket hall, turn around and you'll be greeted by a wire mesh elephant. The sculpture is the work of Kendra Haste, and was originally designed for the Platform for Art programme. It's a fitting reminder that the station stands next to the site of Astley's Amphitheatre, often credited as the world's first circus ring, where elephants were regularly on the bill. 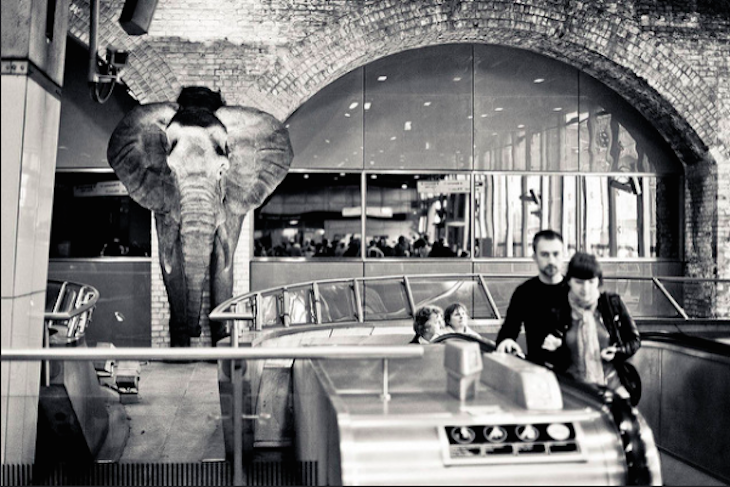 But this elephant isn't the only animal you'll find in the station. A member of Waterloo station staff also suggests travellers with time on their hands go on a lion hunt. They told us: "The station had the South Bank Lion guarding the entrance during the Festival of Britain, and although that one's no longer here there are still lots of them around the station. I could tell you where they all are but that would spoil the fun..."
Also known as 'Graffiti Tunnel' or 'Banksy Tunnel', this 300 metre multi-coloured stretch of spray painted passage can be found underneath Waterloo station. 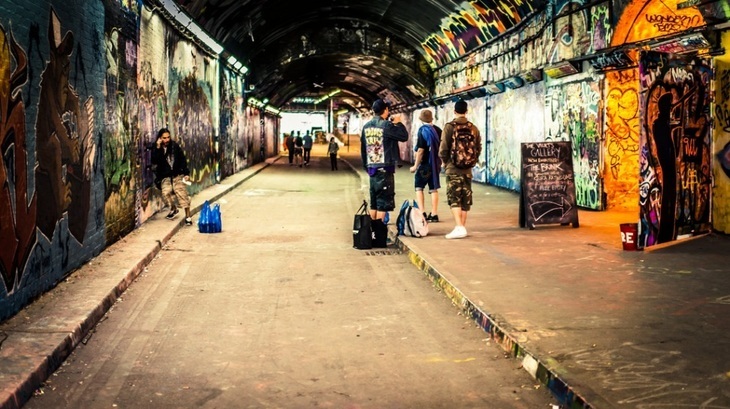 It's been a site of graffiti artistry since Banksy's Cans Festival in 2008. Take a wander through the tunnel at leisure and admire the flamboyant creations... you may well see a masterpiece in the making. Hanging high over the concourse is the Waterloo Clock, (manufactured by Gents of Leicester) — a popular meeting point for Londoners since the 1920s. As View from the Mirror points out, it is beneath this four-sided clock that everyone's favourite Peckham lad, Del Boy first meets his future wife, Raquel. While you're waiting for a friend (or latest Tinder date), listen to Tim Key's poem in which Martin Blousy waits "under the big clock thing" with just a game of Snake and an endless supply of Magnums to keep him going. Will Anne show for their date at the BFI or won't she? Could you too be stranded under the clock with just Tim Key's dulcet tones for company? 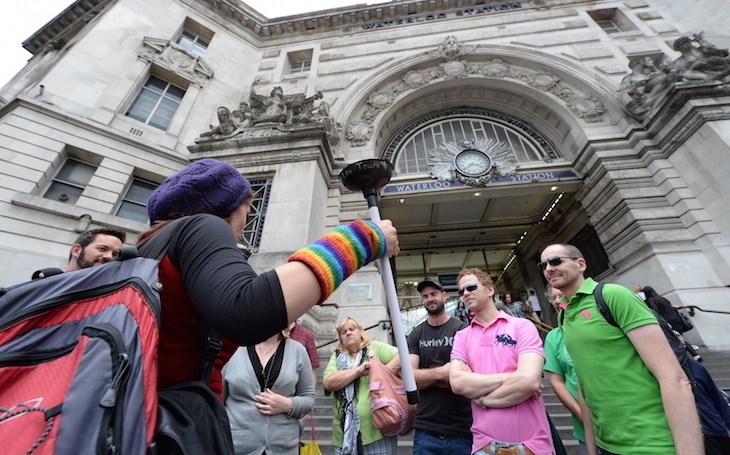 The 'ladies that loo' begin their 90-minute tour at Waterloo station (your guide is the one holding the plunger in the pic above) where you'll learn that the story of the humble loo is inseparable from London's history and politics. In fact 40% of the UK's public toilets have closed in the last decade and in London, public loos are being sold off for bars and cafés (check these out in this here). Advanced booking is essential and toilet humour is positively encouraged. If you're caught short, Rachel Erickson, founder of London Loo Tours recommends skipping the public loos (and saving your pennies) by heading to The Beer House opposite platform three. The pub's little-known loos first appeared in Jonathan Ralph's 1988 Good Loo Guide. Apparently, this was the site of the main gents at Waterloo, until they were converted in 1986. 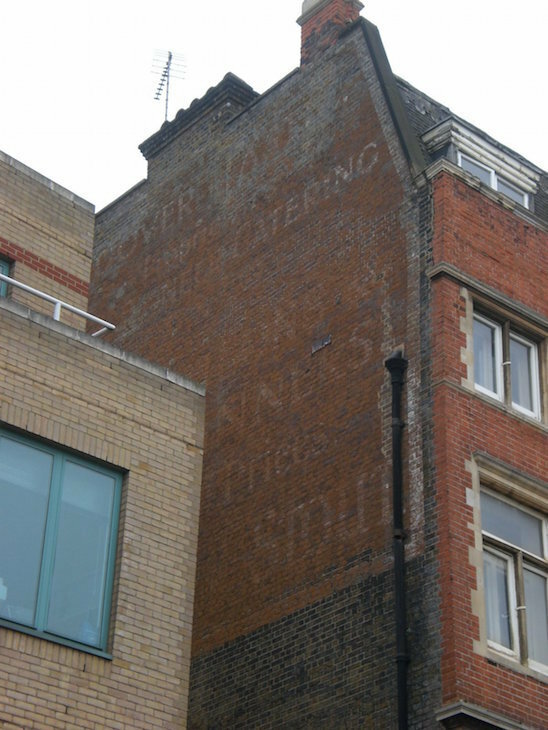 Just behind Waterloo station — and facing Westminster Bridge — is a faded sign for Old Dover Castle; this was a pub or gin palace that was around from the late 1860s to the mid 1940s. According to one observant commenter on Faded London, the 'catering' that can be made out in the ad relates to the dining rooms inside. Once you've reminisced about a time when pints were cheap and smoking was permitted inside, make your way to Waterloo Road to see if you can spot the even more elusive sign for 'Breakfasts, Dinners, Teas'. Between the advertising boards in this pedestrian tunnel (which is only open during busy periods) underneath platform 12 is a memorial dedicated to the Waterloo Free Buffet, which at its peak fed 25,000 men a week during the first world war. As this BBC World War One at Home clip explains, more than 250 women volunteers served up sandwiches, fruit, cake, biscuits, beverages and reading literature for soldiers, merchant seamen, refugees and allied troops from around the world, who were either on leave or on their way to the front. According to a 1920 article in The Times, the volunteers were the first to feed casualties brought to Waterloo by Red Cross trains, and special staff were organized for ambulance work. Next time you lunch at Waterloo, spare a thought for those on more perilous journeys. 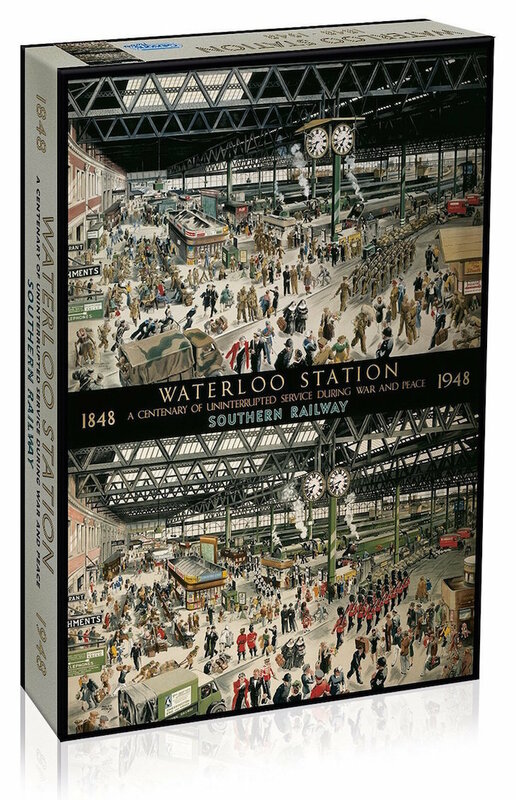 This Waterloo Station puzzle is the oldest in the Gibsons Games range. Find a quiet corner of the station and complete this Gibsons puzzle of Waterloo station, created by Gibsons Games to mark the station's centenary. Painted by Helen McKie, the puzzle depicts Waterloo station, in peacetime and wartime, the first in 1848 and the second in 1948. If you manage to complete the puzzle, you'll be able to compare this year's passengers to those who passed through all those years ago. Though you might need a hand if you want to complete this 1,000 piece puzzle AND catch that train to Guildford on time.